A small miracle happened today. 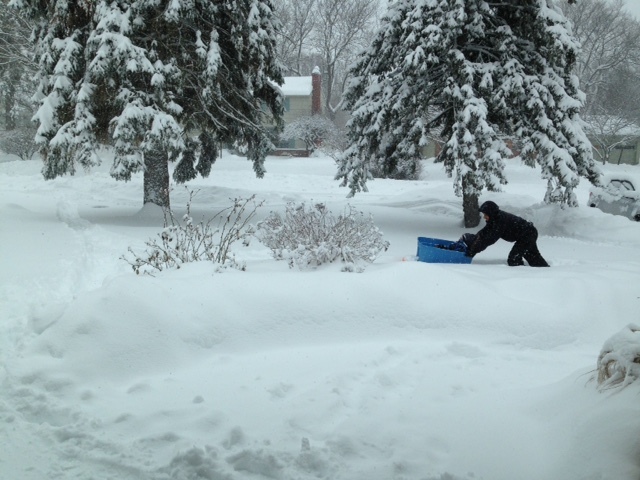 We had a massive snow storm—about 18 inches in fewer than 18 hours. It fell fast enough to close down most of Rochester—which is no small feat. And when the town snow plow came by, it left NO SNOW in our driveway. That’s right. NONE. Look! No snow dumped in our driveway! Here’s what she did. About 20 feet before our driveway, she raised the plow off the ground, which caused all of the snow the plow was pushing to fall into the street. 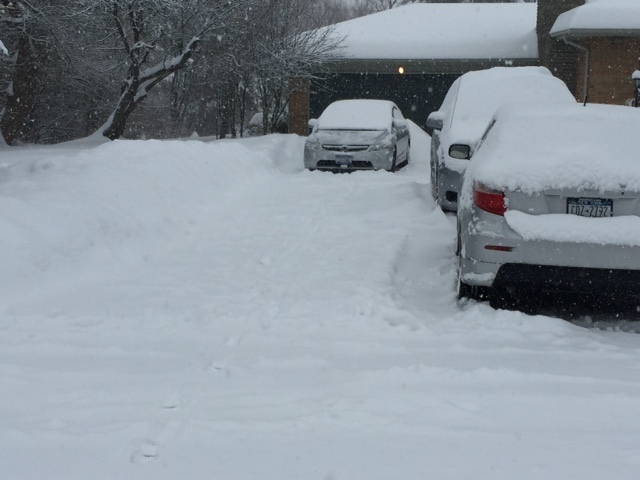 She then lowered the plow again as she reached our driveway, continuing to plow. She then turned around to plow the other side of the street, and when she reached the area where she had let the snow fall into the street, she drove into that side of the street and pushed the snow into our yard. Then backed up the 20 feet and continued on her way. So a pile of snow sat in the road, on one side of the road, for about three minutes until she got to her turn-around point and came back. The maneuver of pushing the snow into our yard and then reversing to continue the usual route took about 30 extra seconds than the usual method of plowing. 30 SECONDS. Yep. For five years we have been told that there is nothing that could be done. This woman solved the problem in 30 seconds. And she was friendly, and kind—and she had been up since 2:00 am! She performed this maneuver at around 11:00 am, and again around 3:30 in the afternoon. I will still meet with the town supervisor so we can firm up a long term plan. But it seems to me this amazing woman showed us today just what the long term plan could be. Thank you plow #56 driver! 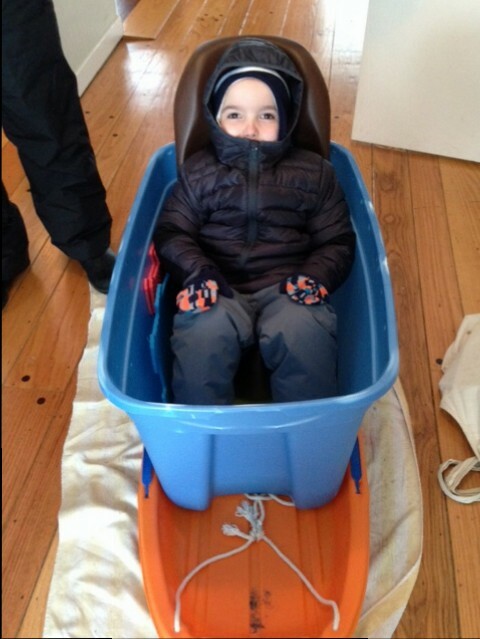 David, Oscar, and I are truly grateful for the outpouring of support that arose from the initial blog post regarding the snow plow issue. I really had written the post to vent, in order to be able to fall asleep that night. The ensuing ideas and offers of help were amazing. We shouldn’t need an army of support to deal with accessibility issues, but we are deeply grateful we have one. Thank you for helping make accessibility a priority—for all people, not just for Oscar! 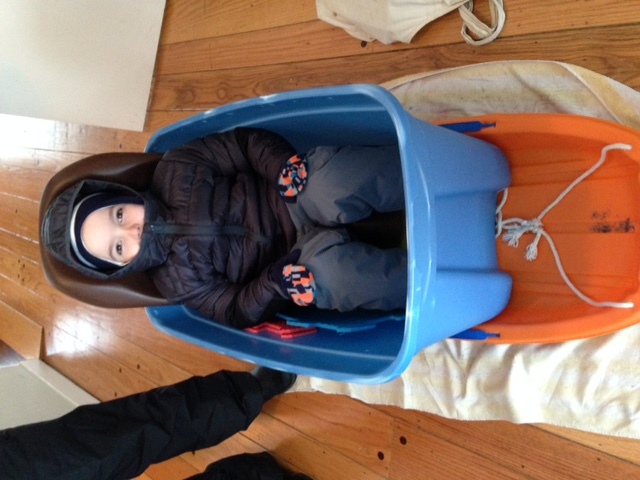 Oscar prepared for sledding this afternoon! Oscar and David cruising through our yard!